Update 6: While we wait to learn what was discussed during Mary Barra's Monday afternoon meeting with Larry Kudlow, here's a chart to put today's job cuts in context: GM's job cuts are the seventh largest since 2001. GM also claimed the sixth-place spot with layoffs of some 20,000 workers in Detroit during the depths of the crisis. Update 5: The Trump Administration can't say they weren't warned. Marry Barra is meeting with Trump Chief Economic Advisor Larry Kudlow on Monday after announcing that the company would lay off as many as 14,700 workers in key swing states that helped elect Trump in 2016. Barra warned the administration over the summer that auto tariffs would lead to "a smaller GM." Now that's happening (though the administration is still mulling a decision on auto tariffs, though it has moved ahead with its protectionist agenda). Meanwhile, Jerry Dias, the head of Canadian autoworkers union Unifor, said that GM won't be closing its Oshawa plant without "a hell of a fight." He also requested a meeting with Barra, and is planning to meet with Prime Minister Trudeau. While we don't know what Kudlow is planning to say to Barra, we suspect that he might remind her about a certain tax-cut package that has saved GM and thousands of other US corporations hundreds of billions of dollars already - not to mention the fact that GM is still a profitable company, despite its lagging share price. Update 4: The massive job cuts that GM is undertaking as it closes five plants in North America have infuriated politicians in Ontario and the US who will be stuck grappling with the consequences of how to help thousands of soon-to-be unemployed blue-collar (and white collar) workers. As they have vowed to fight the cuts, autoworkers unions in both countries have raised questions about whether firing thousands of workers violates the terms of the 2009 Treasury funded bailout that saved the "Big Three" US carmakers from bankruptcy. Now, one former Obama official has weighed in: Steve Rattner, who led Obama's auto task force, which helped organize and oversee the bailouts, said he doesn't believe they do. It was always the Obama Administration's intention that GM and its peers run their businesses responsibly, including implementing meaningful cost-cutting measures to adjust for changes in their business environment. "I don’t think these violate the 2009 agreement, in part because we always made clear that GM should be free to run its business in the ordinary course," Steve Rattner, former chief of President Obama’s auto task force, says in an email. "The passage of more than nine years is an important factor - there has been much change in the auto world over that period and it’s important for GM to be free to adjust its business accordingly," he added. The bailout ended on December 18, 2014, when the Treasury Department sold its last remaining shares of Ally Financial, formerly known as General Motors Acceptance Corporation, which it had bought for $17.2 billion during the depths of the crisis to infuse cash into the failing GM subsidiary. The Treasury Department sold the shares for $19.6 billion, earning a tidy $2.4 billion profit that wasn't nearly enough to offset the losses on GM and Chrysler. It used to be that "what's good for the country is good for General Motors, and vice versa." As any of these workers would tell you, that's clearly no longer the case. 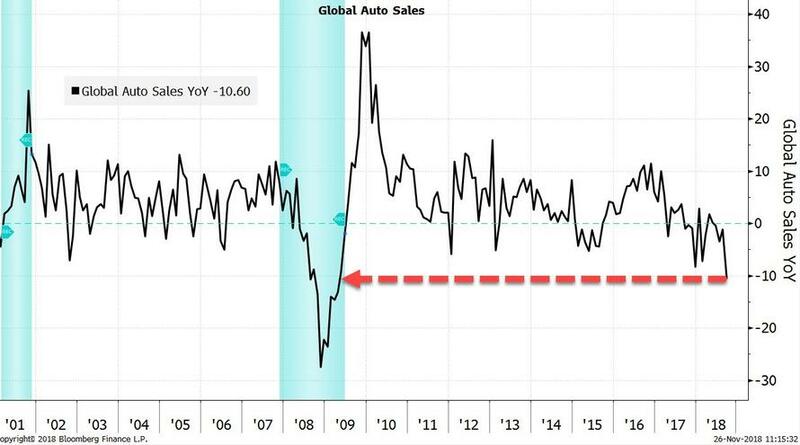 Update 3: In case you were wondering why GM would be doing this amid 'the greatest recovery' of all time and global synchronized growth; this chart should help!! Update 2: The cutbacks announced by GM Monday morning were more severe than most analysts expected - and were certainly steeper than leaked reports published late Sunday and early Monday had suggested. 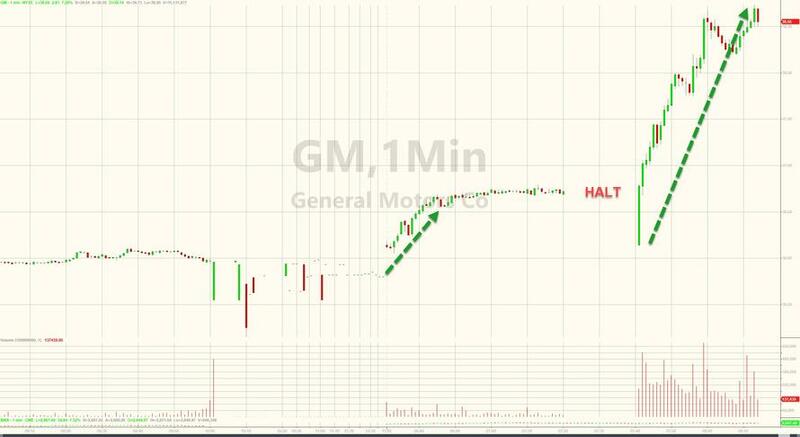 After GM shares were halted pending news following a 2%+ jump after the open, Barra revealed that the company would shutter 7 plants (5 in North America and 2 international) after 2019, fire 15% of its salaried workforce and shift hiring priorities to more tech workers in a cost-cutting drive intended to save the company some $6 billion by the end of 2020 ($4.5 billion will come from cost savings, $1.5 billion from lower capital spending). As GM seeks more workers with "different skills", it also plans to shift its investment focus toward electric and autonomous vehicles. Canadian Prime Minister Justin Trudeau has expressed "deep disappointment" at GM's decision to close its plant in Oshawa, Ontario. He reportedly spoke with Barra over the weekend. The company's shares ripped higher after the trading halt ended, climbing 7.6% in their strongest one-day jump since Oct. 31, when the company announced some of its cost cutting plans and said it expected EPS for 2018 toward the high end of its guidance. Barra said the cutbacks are a response to sagging car sales in domestic and international markets (sedan sales have floundered while pickup truck sales remain robust) and the impact of Trump's trade war. The steel tariffs alone have already cost GM some $1 billion this year, the company said. "We are taking this action now while the company and the economy are strong to keep ahead of changing market conditions," Barra said during a conference call with reporters. The UAW, the union that represents most of GM's hourly labor force in the US, says it will do everything it can to resist GM's plans. Canada's innovation minister Navdeep Bains also decried GM's plans. *UAW SAYS GM PRODUCTION DECISION "WILL NOT GO UNCHALLENGED"
The company's white collar workers number roughly 54,000 in North America, according to WSJ, which speculated that most of the job cuts would come from GM's bloated product-development division. Update 1: Former Nissan Chairman Carlos Ghosn is locked up in a Tokyo jail cell, but GM CEO Mary Barra is apparently channeling the spirit of the auto executive nicknamed "Le Cost Killer". GM shares climbed 0.6% at the open after the company announced production cutbacks that were larger than initially reported. In addition to shuttering the Oshawa plant, the company is also planning to halt production at its Warren Transmission plant in Michigan, as well as another plant in Ohio (in addition to the closure in Oshawa). The company also plans to stop selling some of the company's least popular models. The plants - Lordstown Assembly in Ohio, Detroit-Hamtramck Assembly and Oshawa Assembly - all build slow-selling cars. The company is expected to officially announce its latest round of 'cost cutting' measures on Monday. With car sales in the US and China locked in a precipitous slowdown that is only expected to worsen, GM on Monday announced the closure of one of its oldest Canadian plants as the company hopes to move more production to Mexico and (hopefully) bolster its lagging shares, Reuters reported. The company's plant in Oshawa, Ontario - the plant in question - produces slow-selling Chevrolet Impala and Cadillac XTS sedans, while also completing final assembly of the better-selling Chevy Silverado and Sierra pickup trucks, which are shipped from Indiana. The outcry from the union and local officials is already causing political pressure on GM to mount after the carmaker accepted billions of dollars in subsidies from the Canadian and US governments after filing for bankruptcy nearly a decade ago. But the company must weigh these considerations against the demands of Wall Street analysts, who believe that GM has too many plants in North America. Signaling the start of the carmaker's latest cost-cutting initiative, the company said on Oct. 31 that about 18,000 of its 50,000 salaried employees in North America would soon be eligible for buyouts. Two sources told Bloomberg that the announcement of the plant's closure is expected on Monday. Unifor, the Canadian autoworkers union that represents the plant's employees, told Bloomberg that it has been told there is no car production planned at the factory beyond next year, raising the prospect of talks to preserve jobs. Unifor National President Jerry Dias said back in April that the Oshawa complex had been slated for closure in June of this year. But he added that one top GM Canada executive had vowed that it wouldn't close on his watch. "We have been informed that, as of now, there is no product allocated to the Oshawa assembly plant past December 2019," Unifor said in a written statement Sunday night. "Unifor does not accept this announcement and is immediately calling on GM to live up to the spirit" of a contract agreement reached in 2016, the union said. Canadian lawmakers said they're fighting to keep the plant open because thousands of jobs are on the line. "We are aware of the reports and we will be working in the coming days to determine how we can continue supporting our auto sector and workers," a Canadian government official said. "The jobs of many families are on the line," said Colin Carrie, a Member of Parliament for Oshawa. "Communities all over Ontario would be devastated if this plant were to close." Oshawa Mayor John Henry told CBC that he hopes the planned closure is "just a rumor", and that he had not spoken to anyone from GM. According to the carmaker's website, the Assembly plant in Oshawa employs roughly 2,800 workers - down from ten times that number in the early 1980s. Production at the plant began in November 1953. "It's going to affect the province, it's going to affect the region...the auto industry's been a big part of the province of Ontario for over 100 years," Henry said. As the CBC pointed out, the Oshawa plant was a talking point during the negotiations for Trump's USMCA (Nafta 2.0) deal. "Every time we have a problem...I hold up a photo of the Chevy Impala," Trump once said about the negotiations. And while this closure would certainly be bad news for Canada, the situation could always get worse - particularly if Congress refuses to pass Trump's USMCA trade deal, raising the possibility that the US, Canada and Mexico would revert to WTO rules, potentially throwing GM's foreign North American operations into chaos.